Having a new look, an improved display panel, and paper capacity to satisfy any SMB, the stackable 2005 HP LaserJet 4700 still delivers the high-resolution color prints and features of its predecessor at 31 pages per minute. There are five variations in the LaserJet 4700 series: The basic 4700, the 4700n with Ethernet, the 4700dn with Ethernet and duplexer, the 1,600-sheet capacity 4700dtn, and the 4700ph+ with all of the features of the 4700dtn, plus two more additional paper trays and a hard disk for extra data storage. The network, memory, and extra paper tray are available as optional accessories and can be easily added to any printer with no more than a screwdriver. 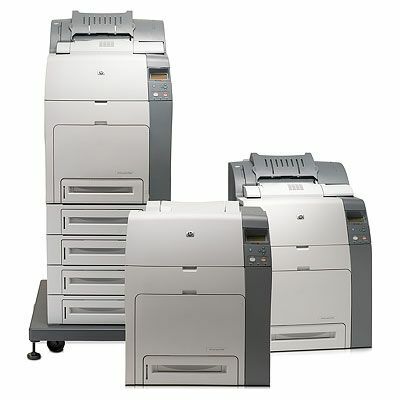 The LaserJet 4700 has a bigger footprint than HP’s previous generation color lasers. Starting weight at 105 pounds, the printer takes up a 21-by-24 inch footprint in your office, dwarfing many monochrome laser printers that may be sitting beside it. The 4700ph+’s features make it a floor model printer, when the optional rolling stand is purchased. Businesses looking to buy a color printer of this caliber usually get the networked 4700N so right out the box it’s ready to be accessed by multiple computers. The 4700 does include Parallel and USB ports for direct connection to a computer, but there are smaller and cheaper color laser printers that will handle the needs of a single user. The LaserJet 4700 comes standard with a 500-sheet cassette tray, capable of holding over a ream of letter or legal-size paper. For more capacity, four more 500-sheet cassettes can be stacked to bring the total printing capacity to 2,600 pages. The flip-door on the bottom of the printer reveals a 100-sheet multi-purpose tray that can handle transparencies, labels, post cards, envelopes, and to 8½” x 14” legal paper of various bond weights up to 60 pounds. Using a fuser-on technology, the LaserJet can go from sleep to print in 15 seconds. The LaserJet 4700 can print up to 31 pages per minute on single-side paper. Single-pass color printing allows color print speeds to be as fast as many monochrome laser printers in 2005. To achieve the 2400 x 2400 color resolution HP utilizes a technique where each dot in the native 600 x 600 dpi contains 4 colors. Think of it like having a whole pie then cutting it up into 4 smaller pieces. At the maximum print resolution text is reasonably sharp, and photographs are very detailed with smooth color transitions. If you want to print in B & W, the printer software will allow for you to only use the black toner, saving on color toner. In addition to USB, the LaserJet 4700 also has a Parallel port interface. The built-in 160MB of printer memory can be expanded up to 512MB, enabling the LaserJet 4700 to easily handle workloads as a high-volume network printer. The CD that comes with the LaserJet provides software support for Windows, Linux and early OS X systems. What’s interesting is for the “Wintel” market, HP also gives printer administrators a “B&W only” driver, to manage users who won’t need color printing, saving on toner consumption. The HP web site has drivers to support some of the newer operating systems. If you happen to be an administrator responsible for several networked HP printers, HP’s JetAdmin web application gives you the ability to remotely monitor and manage multiple network LaserJet and HP Inkjet printers. To remotely change network printer configurations and notifications, the JetAdmin service allows printer management using your IE, Safari, or Firefox Internet browser. This is one printer you don’t want to keep by your desk. Sitting silently idle, the LaserJet 4700 produces 67db of sound when printing. To give you an idea of what that means: 65 decibels is about the level of loud conversations. If you have a quiet workplace, you don’t want to place this near any office cubicles, but its noise will hardly be noticeable in a copy room or break room. What I’m hoping is this is just an oversight by Hewlett-Packard; no 4700 support is mentioned on their web site for the new Windows 7 operating system. Drivers must be available since Windows 7 operates using the same OS kernel as Vista and Server 2008, which HP does support. 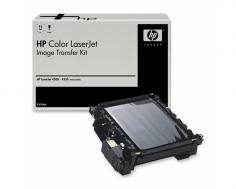 Review it: "HP Color LaserJet 4700 "
Normally the purchase of a color laser means having smaller toner cartridges, therefore less pages. Not the case with the 4700. Out of the box, HP includes a standard 12,000-page yield black cartridge, and three 11,000-page yield color cartridges, one for each color (Cyan, Yellow, and Magenta). Those numbers are based on 5% ink coverage per page. To give you an idea of what that means: A print out of a mostly text web page will need 10% ink coverage; a newsletter 30%, and a print with graphics, text, and photos can exceed 60%. These “no-shake” design cartridges can be purchased separately, especially if the black toner gets depleted at a higher rate than the other colors. Combo-packages are available to save costs. 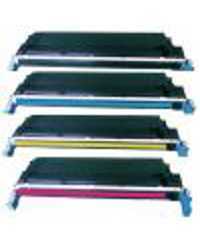 Other consumables you’ll need to consider is replacement of the Image Fuser every 150,000 pages and the Image Transfer Unit every 120,000 pages.